Welcome anglers from around the world! Cozumel offers just about all the species that are known to be deep sea fighters, from blue marlin to white marlin, black and yellowfin tuna, wahoo, mahi-mahi, great barracuda, mackerel, grouper and more. If you’ve always loved deep sea fishing...this is the place! If you are a beginner...what a place to get started! The MESTIZO team offers you the equipment, the expertise, the passion, the bait, the lunch, the beer and the beverages. All you have to provide is the luck and the fight! 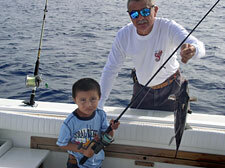 Just 20 minutes from shore, we can take you fishing right outside Cozumel’s National Marine Park. For a full-day fishing trip, we usually head to the shores of what is known as the Mexican Riviera, along the coast of the Yucatan Peninsula. Fishing with family and prefer bottom fishing? What a thrill for the kids! So what are you waiting for? Let’s go fishing! All prices subject to 16% IVA Federal Tax. In all cases the maximum number of passengers is 4. We will pick you up at your hotel, provided it has a pier. We release all bill fish and keep only what you want to eat. We care about nature. We love fishing.